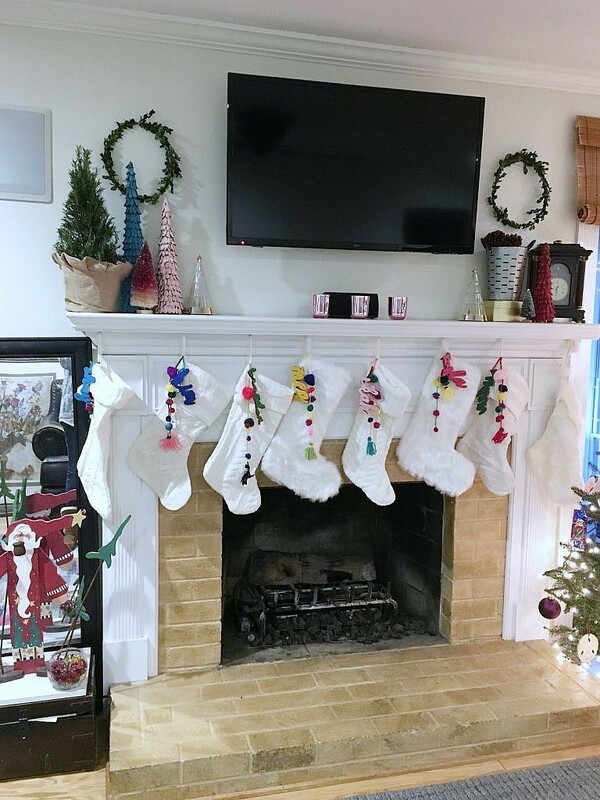 A handful of Christmas Fireplace Mantle decorating ideas incorporating pinks and reds and lots of nostalgic touches! Hi! 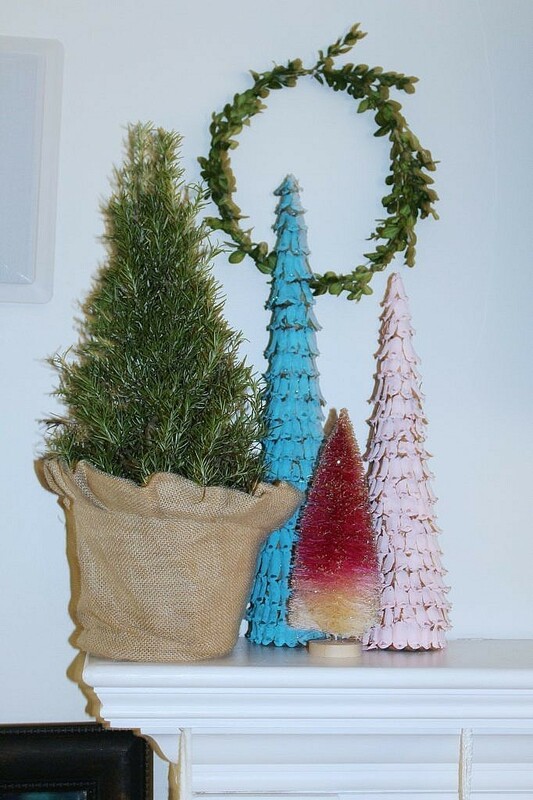 I’m popping in today to share some more Christmas decorating tips with you! 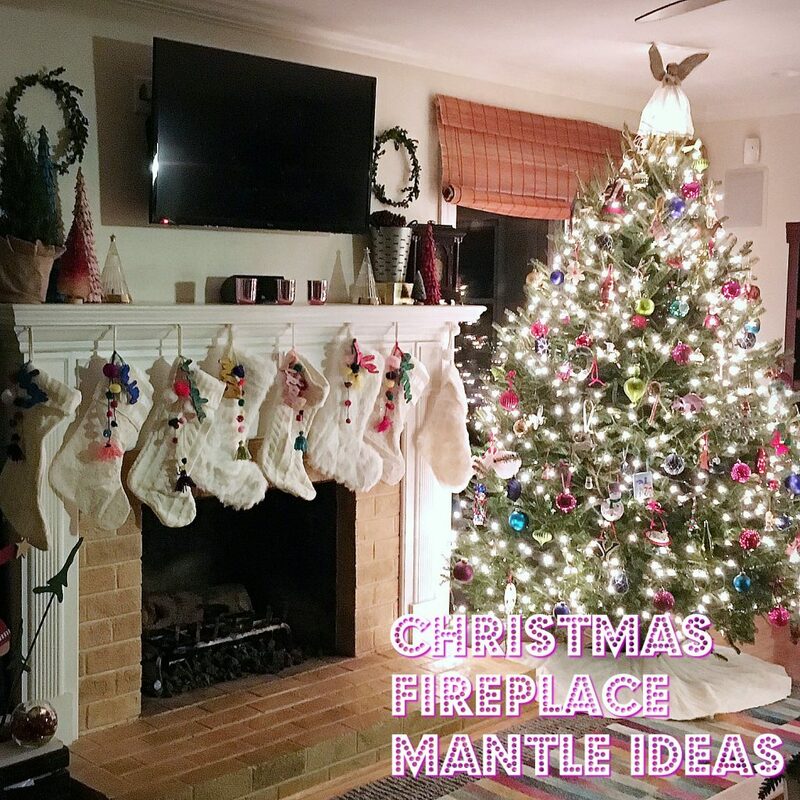 This time we’re talking about your Christmas Fireplace Mantle! Some friends and I are sharing all of our favorite ideas – be sure to scroll down to visit all of the mantles in this hop! Oh, and before I forget – Thank you for all of the love on my Vintage Modern Christmas tablescape! I’m so glad so many of you liked it. Christmas tablescapes are always so much fun to put together! I hope you were able to find all kinds of inspiration for your table this season! I struggle a little bit with decorating our fireplace because of where it sits in my living room. It lies between two windows, but it’s not centered between them, making me a little bit crazy and providing a bit of an awkward view. On top of that, like many of you, my television is above my fireplace mantle, which is a whole lot less pretty than a giant mirror or beautiful art. It’s a challenge for sure! For this year’s mantle, I reused many of my old favorites from last year and just rearranged them in new ways. I purchased my stockings at Target and added the personal stocking tags last year. I’m so glad to have finally found socks that will have some staying power and adore the whimsy and color of the stocking tags. 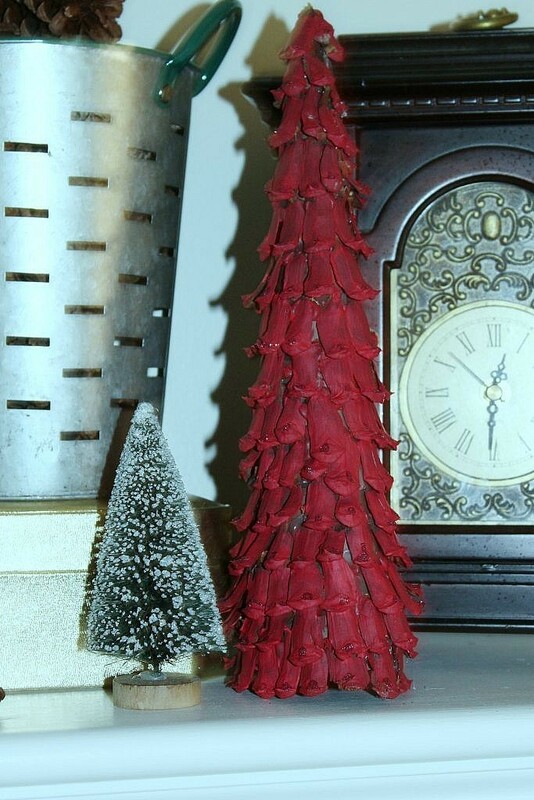 The pinecone petal trees moved from my dining table last year to the Christmas Fireplace mantle this year! I love how they look placed over the fireplace. 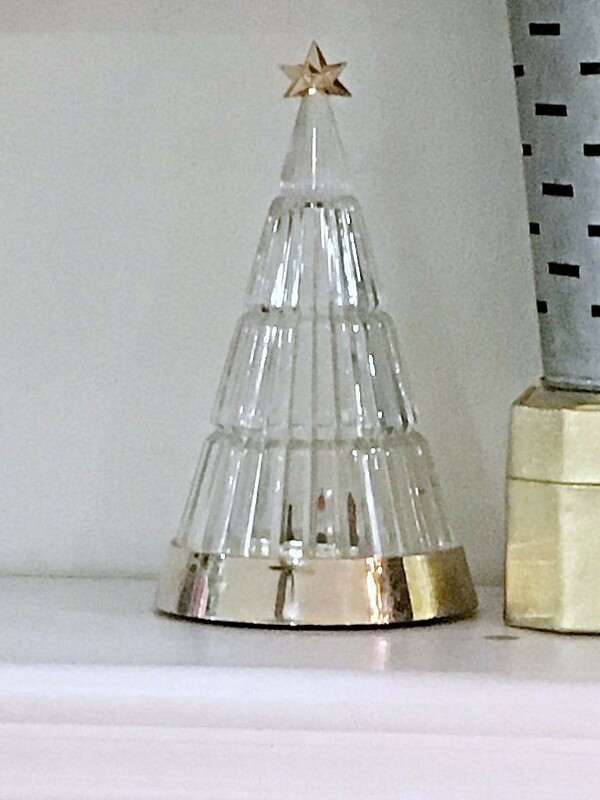 The crystal trees are vintage – if anyone of you had an Avon lady in your family back in the 70s and the 80s you’ve probably seen these before! They used to have three little lights inside that twinkled off the Crystal facets. The lights on these lamps haven’t worked for quite some time, but I love them just the same. They remind me of Christmas growing up. There are always warm fuzzies when I put them out each year! I did add a few new items this year. The pink candle holders have a slight mercury glass finish and came from the target Dollar-spot. 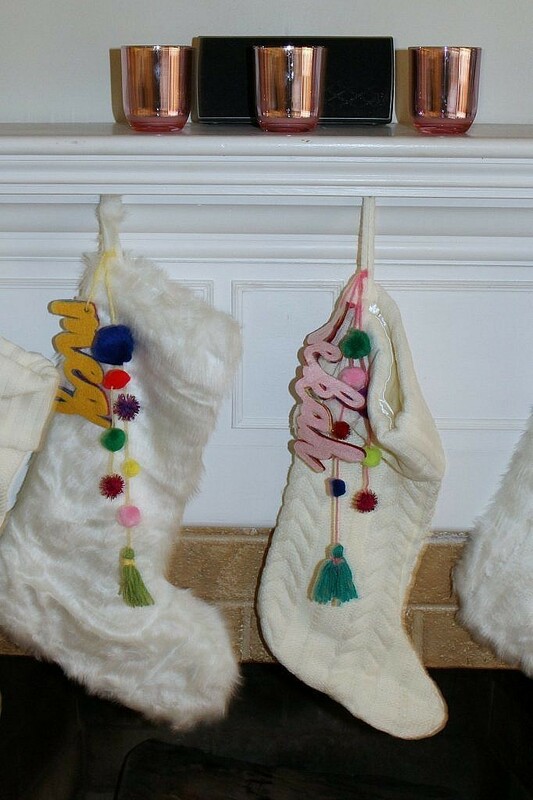 I love how the pink complements the colorful stocking tags. On the left and I added a pruned rosemary tree – it smells heavenly mixed with the evergreen of the Christmas tree. On the other side, stands our Christmas tree. 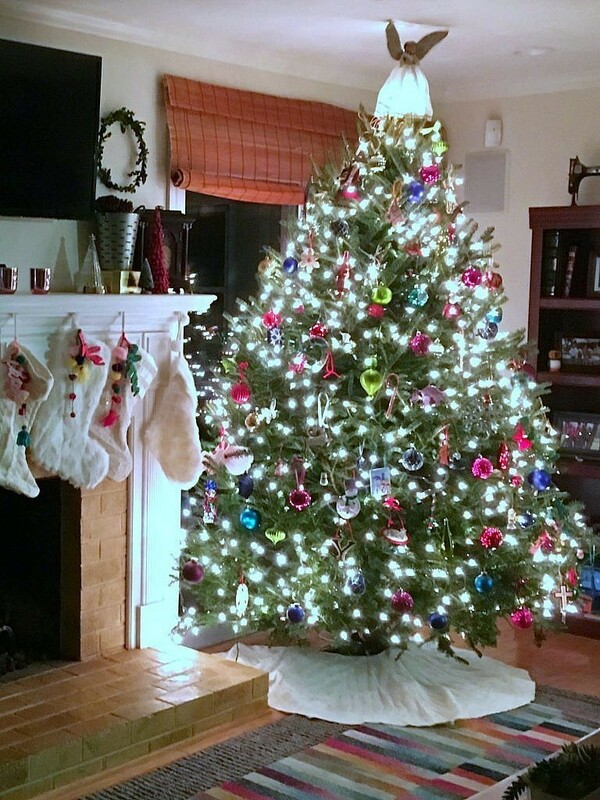 I think it quite possibly is the most beautiful tree we’ve ever had and I love how the Christmas tree lights dance and twinkle on the glass and crystal. 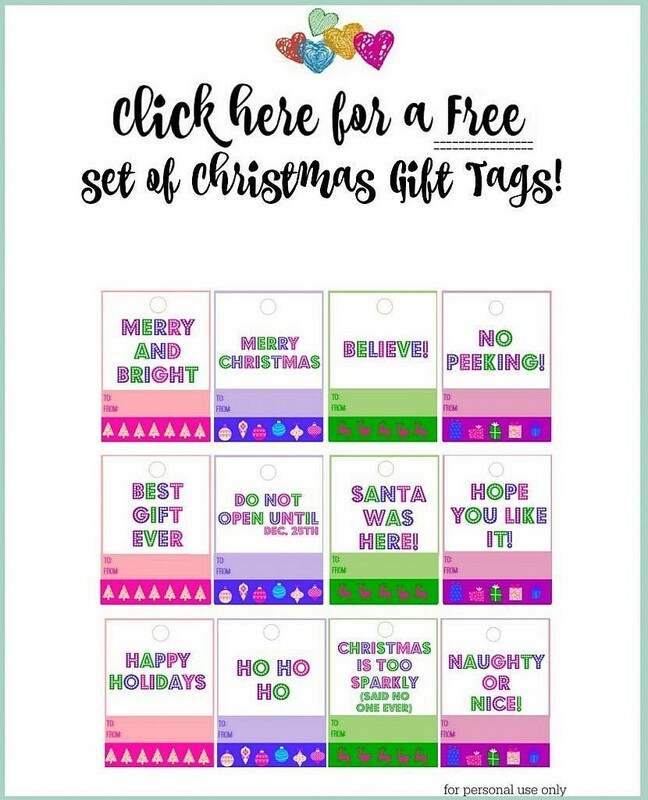 I topped the few gifts I’ve wrapped with these adorable gift tags, available for free download to those that subscribe to my newsletter! No spamming! I promise! You’ll also gain access to the members-only Goodies area, packed full of all sorts of fun printables! A mirror is leaned to balance out the windows, and a small crate holds family photos. 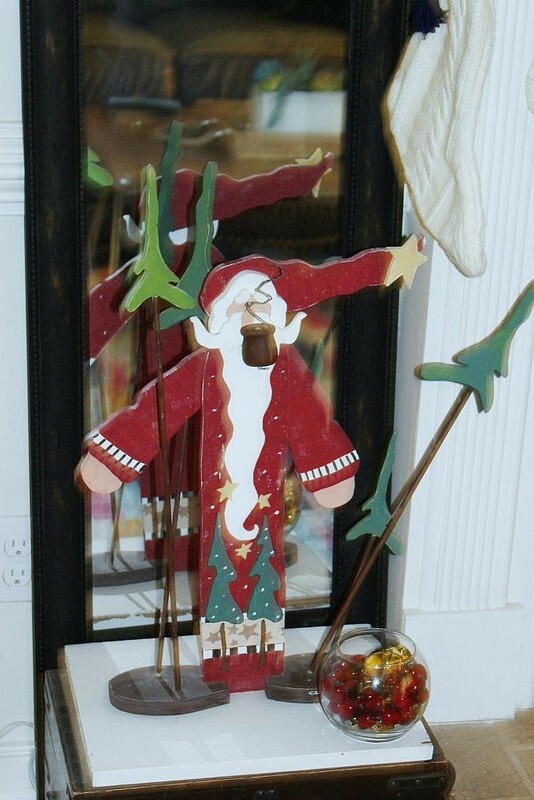 One of my most prized possessions sits atop of the box; A folk-style Santa, complete with pipe, made for me by my mother the year before she passed away. It’s still as lovely today as the day she made it for me and brings back so many happy Christmas memories. I can’t fix the window situation or move the TV – at least without a family mutiny. But I can enjoy the magic of Christmas, complete with old and new treasures and lots of twinkly, glittery lights. Thanks for sharing that magic with me! 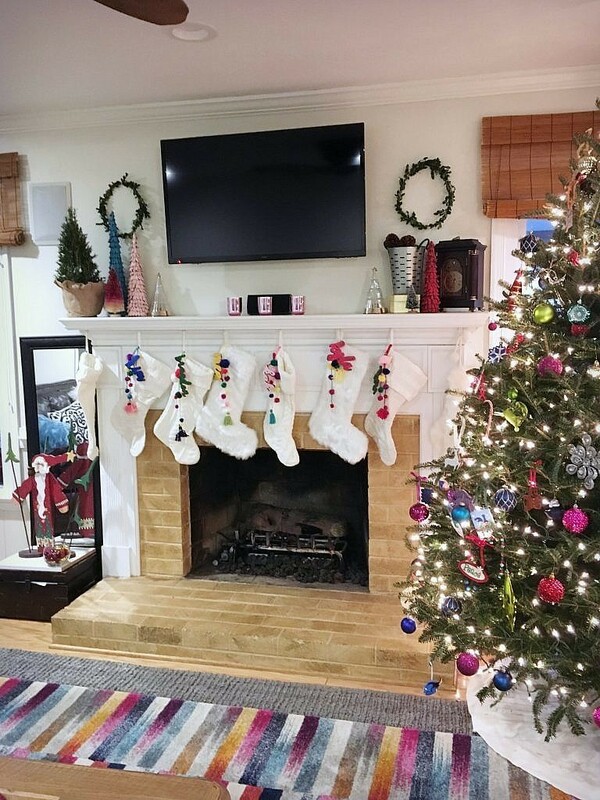 Kim – we love your mantel and colorful display. The stocking tags are fabulous! Too bad we didn’t see those pink/copper mercury glass votives…so pretty! Thank you, Vicki and Jenn! The stocking tags are still my favorites too! I wish you had – they were such a great price! I love all of the color – it’s so you! The tree and the stockings look great together! Thanks, Meg! You know I love to surround myself with all that glitters and sparkles! Kim, the colors are amazing! 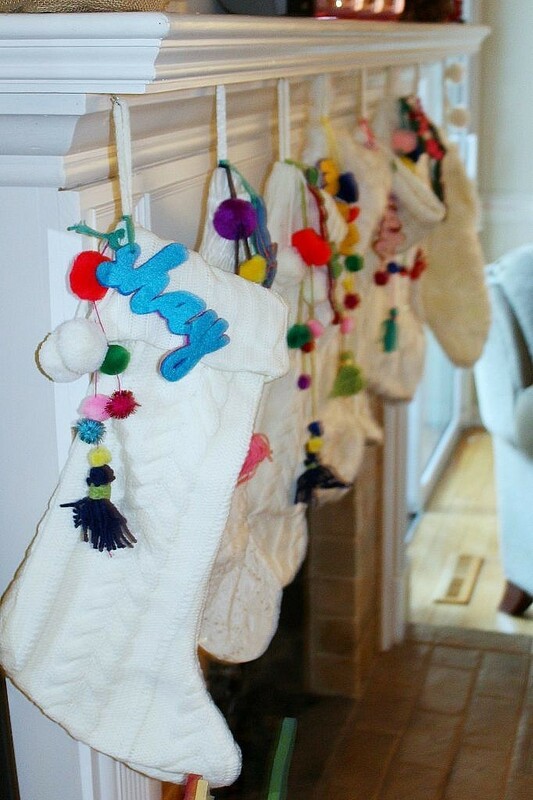 The stocking tags idea is brilliant and the stockings are so cute. 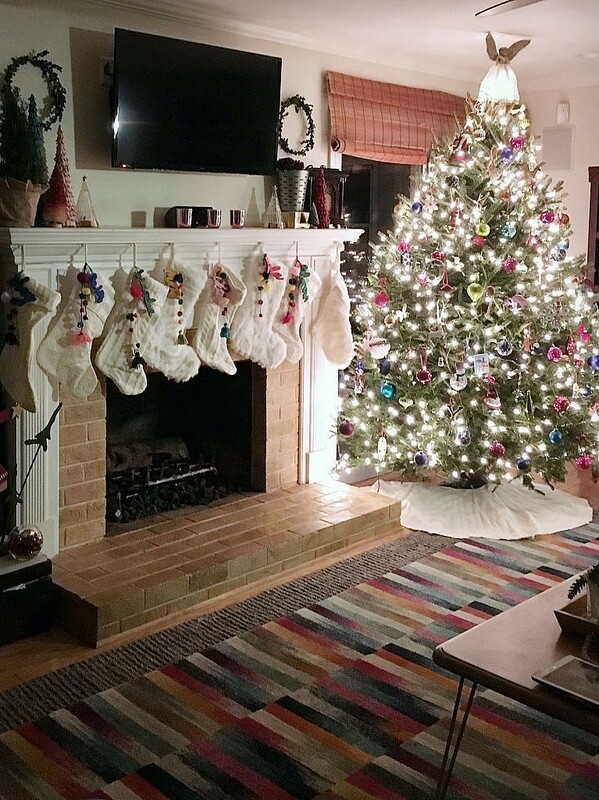 Love your festive Christmas mantel! Thank you, Bre! Merry, Merry Christmas to you! It’s so festive, cheery, and bright! I love those stocking tags. I remember those from last year! I hope you’re Holiday is the best! 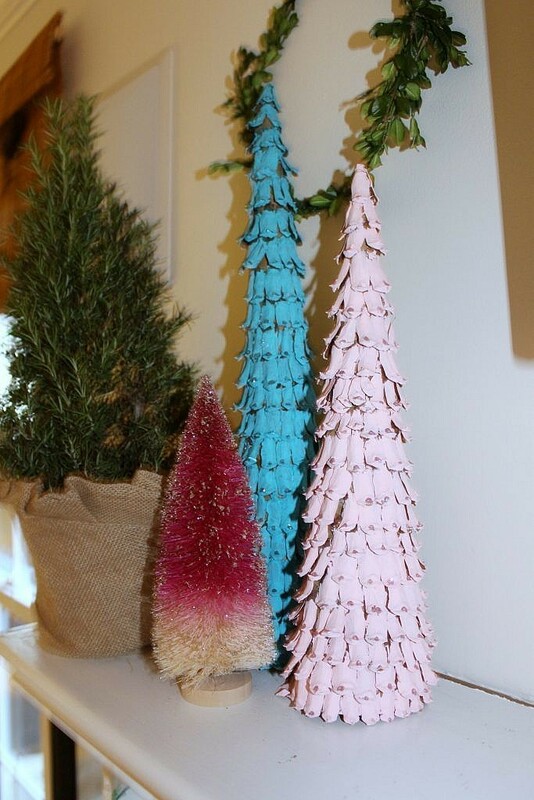 I think I need some of those acorn Christmas trees for my Christmas tree farm! Love everything you did!